Last year I took a year-long placement as a video editing support technician. The role exposed me to the common issues that students run into when editing their projects, and I developed an understanding as to why they might struggle understanding the complexities of video workflow. As a student myself I can understand why workflow can be a difficult topic for some to understand. For those that aren't as technically savvy as others, even the mention of workflow can make them lose focus and switch off completely. The post-production industry is constantly evolving, with new codecs, resolutions and methods of storage on offer, the multitude of choices on offer can seem daunting to fellow students. With the attitude of wanting to simply 'edit' and no desire to learn the procedures of properly setting up a project and the technical aspects of post-production, many students run into problems that are easily avoidable if the correct workflow is followed. Within the professional post-production world, the offline/online workflow is seen as something of a standard and the foundation of creating any programme or film. Transcoding high-res materials down to a more manageable file size and data rate is common practice, to help with the efficiencies needed in a professional environment. This process is taught to second year students on television and film courses within a post-production workflow module. Some may see the whole transcoding and logging process are counter-intuitive as it is preventing them from beginning their edit, so is deemed as a waste of time. However, it can be argued that logging, subclipping and transcoding is in fact the first and crucial step of editing. As you view your rushes, adding relevant tags and trimming the fat from your footage, you begin to place shots together in your head and a story begins to form. In turn, this makes the assembly of footage on the timeline much easier as you have a proper understanding of the footage you have. 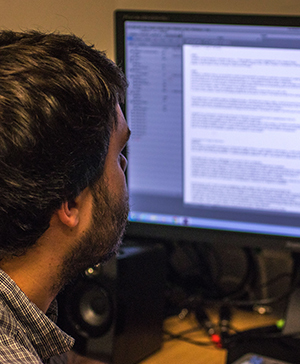 From the perspective of a student, it is important to view post-production workflow as two sides of a coin. On one side is the creative aspect, where you form a narrative and tell a story for the audience. This side is used to creatively put shots together in a way that engages the audience and creates a visually and mentally stimulating video. However, some see this as the whole editing package, and although this is a hugely important part of editing as without it you just get a boring end product, there is a whole other side to editing that sometimes go unnoticed. This is the more technical and computer-focused side of editing. This encompasses elements such as creating appropriate folder structures and naming conventions to house your footage, all the way to understanding how different codecs work and choosing the appropriate codec to transcode your footage to, depending on the type of project. Now, this technical side to post-production may not appeal to certain students, as the benefits it provides aren't as obvious as say having the ability to produce a beautiful looking video. But, these skills are essential to get a full-picture of post-production and really be considered as a 'good editor'. Plus, these are the skills and knowledge that is expected of graduates looking to move into edit assistant roles or similar. One of the most crucial software packages at the University of Portsmouth for teaching post-production workflow is Avid Media Composer. Avid is often thought as the industry standard video editing software platform and is crucial for all future editors to understand, but that does not make it universally adored. Compared to similar packages, most notably Adobe Premier and Final Cut Pro, it offers a much more steep learning curve that either attracts students to learn more about it, or makes them completely shut off from it. This almost love it, or hate it type approach to Avid is interesting, as students often cite its usability and complex nature compared to that of Premier of FCP as the main reason for disliking it. Avid is definitely daunting to first-time users, as it was for me, however the skills it forces you to learn are vital. In in other software packages you're able to get away with certain things, which allows for an easy experience, but are you really learning anything from this. Avid forces you, in a good way, to be aware of technical issues and to learn how to be organised. If you make a mistake, it lets you know this, which helps to create a learning environment. It's also important to note that higher education is the perfect place to get an understanding of Avid and the workflows associated with it. Having the ability to make mistakes and learn from them is a luxury that is perhaps not present within the high-pressure setting of the professional world. Another double-edged sword that affects workflow within the University is 'linking' BPAV rushes. When used correctly, this tool is a great way to review footage, with its fast link times you are able to view your rushes and determine what is necessary and what isn't almost instantaneously. From here, you can subclip and then transcode the footage into one of the DNxHD codecs. Again though, this can be used incorrectly and have a detrimental effect on the project at hand. If used as the sole way of placing footage on the timeline, then it's as if your computer is walking on a tightrope, with a program crash just waiting to happen. Linking is a hugely RAM intensive tool, so if used incorrectly it creates multiple problems that any workflow will find hard to battle against. Ultimately I am pleased to have chosen a course such as BSc Television and Broadcasting where the values and importance of workflow has opened my eyes and truly inspired me to become a great video editor who is both creative, but also one who knows the technical requirements to keep working.